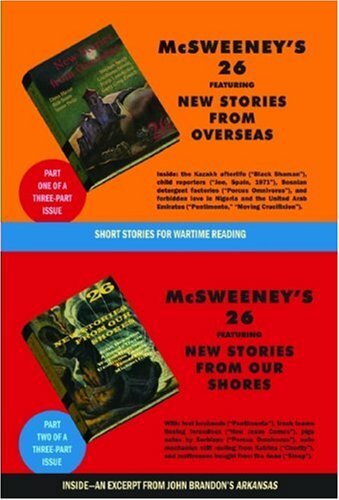 McSweeney's 26 comes in three parts: two small, oblong books of stories by writers large and small (John Brandon, Amanda Davis, Uzodinma Iweala, and eight more), set in regions near and far (Kazakhstan, Bosnia, Spain, Arkansas), and a third book, Where to Invade Next, edited by Stephen Elliott and inspired by actual Pentagon documents, which seeks to give a picture of just how our government could create a rationale for its next round of wars. Read them one at a time, or all at once, but know that this oneÃ¢ÂÂs got it all--whirlwind visions of the world of today, and dead-serious essays about which parts of it the United States might soon be confronting. About: McSweeney's 26 comes in three parts: two small, oblong books of stories by writers large and small (John Brandon, Amanda Davis, Uzodinma Iweala, and eight more), set in regions near and far (Kazakhstan, Bosnia, Spain, Arkansas), and a third book, Where to Invade Next, edited by Stephen Elliott and inspired by actual Pentagon documents, which seeks to give a picture of just how our government could create a rationale for its next round of wars.